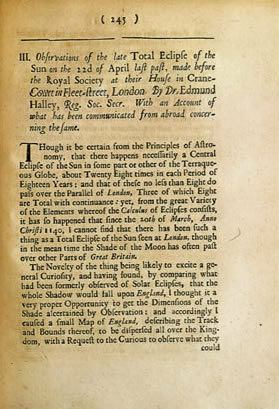 "Observations of the Late Total Eclipse of the Sun on the 22d of April Last Past, Made before the Royal Society at Their House in Crane-Court in Fleet-Street, London. By Dr. Edmund Halley, Reg. Soc. Secr. with an Account of What Has Been Communicated from Abroad concerning the Same." Philosophical Transactions of the Royal Society of London. 1714. 29: 245–262. Called the "most important English natural philosopher after Newton," Halley is best known for his work on comets. By assembling data from antiquity through the early Enlightenment, Halley was able to analyze observations made by Kepler, Tycho Brahe, and Newton, and concluded that orbit around the sun. Halley prepared a catalog of the southern stars, and charted the Atlantic Ocean. The present essay has been called "one of the first examples of large-scale public participation in an experiment."